Are you interested to know the current position of your devices? For example, logistics companies find it extremely useful to know where their trucks are to estimate package arrival time. Additionally, by tracking a vehicle's movements, alternative routes can be designed to optimize fuel consumption and speed in future endeavors. Before creating a Map Widget, Ubidots needs to know where to find the location data from your device(s). In the last two examples, Ubidots will automatically add a value of 1 and make the coordinates part of the value's context to match such format as the first instance. *Please note that you must send "lat" and "lng" values to the location variable's "context" to let Ubidots read your devices location data. See here for additional resources to sending a device's latitude and longitude in the context. Step 1: Click on the top-right "+" button. Step 2: Select the Map widget option. Step 3: Search the devices you want to visualize on the Map. IMPORTANT NOTE: if your dashboard is dynamic and so the Map widget, there's no need to select any device. The widget will show all devices which have a defined location. 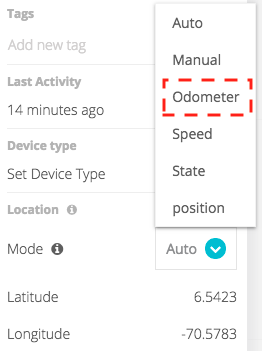 Step 4: Toggle ON/OFF the "Display location history" option to display GPS trace data based on the General time range picker in the dashboards. Select a Layer type: Roadmap, Satellite or Hybrid. Select a Style to theme the map between Light, Dark or Custom (Section 3). IMPORTANT NOTE: Custom option is only available when Roadmap layer is selected. Choose a default Zoom value for the map. Select a Marker pin: "Default" is a simple pin whereas "Inherit from Variable" replace the normal pin with the variable icon. Select Marker color: "Device color" inherits color chosen in the device while "Add color logic" enable an option called "Color logic". If Marker color option is "Add color logic", then Select the color logic based on the variable's value. IMPORTANT NOTE: "Color logic" only works with "Auto" and "Variable-based" modes. Select an "On click action": choose to display a pop-up once the pin is clicked showing "All variables" or "Selected variables" from the device. It is important to note that the Ubidots real-time map display is a live interface. When you select to "Display location history" of data in the Map, your historical data will appear as "dots." Any incoming real-time data will appear as a smooth "line". To update the realtime line to contain the historical data information and be presented as "dots", you need only to reload the historical range of data. Sometimes you want the map widget to have a certain look and feel so it complies to your application needs and requirements. Map widget allows you to import custom JSON file to have the Map Widget read it and change the visualization accordingly. A good source for already created visualization JS Style Arrays files is Snazzy Maps. Step 1: Select Layer type to roadmap. Step 2: Select Style to custom. Step 3: Click on "Open editor" in the "Custom style" option. Step 4: Go to Snazzy Maps and choose a visualization. Step 5: Copy the JS Style Array file. Step 6: Paste it in the Custom style editor. Step 7: Save it and check out the Map Widget Settings. Within the Map widget settings, there's an option label as "Inherit icon from variables". Once activated, the Pin Icon indicating device's last position will change to match the variable icon providing the Latitude and Longitude coordinates. Step 2: Activate the "Inherit icon from variables" display setting. Step 3: Save and view the change. 1. Instead of using Google Maps, which is the default maps service used by Ubidots, you might like try other services like Mapbox. If you want to give it a try, check out this tutorial to learn to write your own widgets in Ubidots with the HTML Canvas Widget.